Acne vulgaris is the most common disorder encountered in dermatology practice, accounting for 3.8 million office visits, or 11.3%.1 Most patients are Teenagers, accounting for more than 2 million visits per year for managing acne vulgaris. Acne is also reported to occur between ages 35 and 44 years. Acne vulgaris is well established as a disease state associated with a significant psychosocial burden, negatively impacting quality of life of many affected patients. An acne blemish begins approximately 2-3 weeks before it appears on your skin�s surface. So while it may seem like you get a pimple overnight, what you�re actually seeing is the final stage of a much longer process. It starts in your sebaceous hair follicles � . Deep within each follicle, your sebaceous glands are working to produce sebum, the oil that keeps your skin moist and pliable. But this sloughing process is different for everyone. You might shed cells evenly � or not. Uneven shedding causes dead cells to become sticky, clumping together to form a plug � much like a cork in a bottle. This plug, or comedo, traps oil and bacteria inside the follicle. Papules: Papules are small, firm cone-shaped bumps that are pink in color. It�s basically a fancy name for an inflamed whitehead. That�s why they�re tender to touch unlike other forms of acne. Not to be gross, but they contain no pus. Since they don�t contain pus you should never pop or poke them. If you do you might seriously irritate your skin and aggravate your existing pimples � and possibly end up with a permanent scar � with zero effect on the papules themselves. Pustules:Like papules, pustules are small, round lesions. You�ll notice they�re red in color with yellowish or whitish centers (caused by visible pus). While inflamed, pustules are generally painless and do not contain a great deal of bacteria. The inflammation is actually the result of a chemical irritation from things like free fatty acids, which are substances that circulate in the bloodstream and are common in everyone�s skin, although it�s possible there are other causes. While it may be tempting to pop a pustule � don�t do it. You could end up with a permanent scar. If you got one that�s particularly bothersome, see your dermatologist to have it expressed properly. Nodular acne appears in large areas of your skin and is usually very painful. What�s the root of all this? Nodules are severely inflamed, hard lesions lodged deep within the skin. Cysts, while similar, are softer, pus-filled lesions, also deep under the skin. They develop when the contents of your comedones (a medical term for whiteheads or blackheads) have spilled into the surrounding areas. Unlike other forms of acne, nodules may persist for weeks or even months, the result of their contents hardening into deep (and stubborn) cysts. 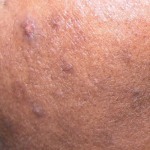 Cystic acne is the most serious type of skin acne although nodules do not always develop into cysts. Both cysts and nodules, although similar, can exist independently as either nodular or cystic acne. They occur together, too, as nodularcystic (or nodulocystic) acne. Left untreated, they are likely to cause scarring, so if you think you have this condition, you should see a dermatologist for treatment. Like most acne, nodular and cystic outbreaks can affect anyone but are more common in teenage boys and young men. Unfortunately, these types of acne often have genetic causes-if one or both of your parents had such outbreaks there is a good chance you�ll have them, too. Back Acne: Back acne is triggered when heat and sweat is trapped against the body, and when your skin is irritated by friction. Acne conglobata (AC) is severe form of acne that can affect your back, buttocks, chest, shoulders, upper arms, thighs, and even your face. AC is characterized by abscesses and scars. Medically speaking, this condition is essentially a combination of acne pustules and nodules, though you might have bacterial infections as well. This is a medical condition, obviously a physically and emotionally destructive one, so if you think you have AC, see a dermatologist as soon as possible.